People were actually taking great comfort in this idea, that this animal was there and might be there when their loved ones eventually pass. He was there when they couldn't be. Dr. David Dosa, a geriatrician and assistant professor at Brown University, said that five years of records showed Oscar rarely erring, sometimes proving medical staff at the New England nursing home wrong in their predictions over which patients were close to death. The cat, now five and generally unsociable, was adopted as a kitten at the Steere House Nursing and Rehabilitation Centre in Providence, Rhode Island, which specializes in caring for people with severe dementia. Dr. Dosa first publicized Oscar's gift in an article in the New England Journal of Medicine in 2007. Since then, the cat has gone on to double the number of imminent deaths it has sensed and convinced the geriatrician that it is no fluke. The tortoiseshell and white cat spends its days pacing from room to room, rarely spending any time with patients except those with just hours to live. If kept outside the room of a dying patient, Oscar will scratch on the door trying to get in. When nurses once placed the cat on the bed of a patient they thought close to death, Oscar "charged out" and went to sit beside someone in another room. The cat's judgment was better than that of the nurses: the second patient died that evening, while the first lived for two more days. Dr. Dosa and other staff are so confident in Oscar's accuracy that they will alert family members when the cat jumps on to a bed and stretches out beside its occupant. "It's not like he dawdles. He'll slip out for two minutes, grab some kibble and then he's back at the patient's side. It's like he's literally on a vigil," Dr. Dosa wrote. 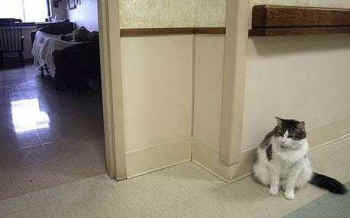 Dr. Dosa noted that the nursing home keeps five other cats, but none of the others have ever displayed a similar ability. In his book, "Making Rounds with Oscar: The Extraordinary Gift of An Ordinary Cat", Dr. Dosa offers no solid scientific explanation for Oscar's behavior. He suggests Oscar is able - like dogs, which can reportedly smell cancer - to detect ketones, the distinctly-odored biochemicals given off by dying cells. Far from recoiling from Oscar's presence, now they know its significance, relatives and friends of patients have been comforted and sometimes praised the cat in newspaper death notices and eulogies, said Dr. Dosa. "People were actually taking great comfort in this idea, that this animal was there and might be there when their loved ones eventually pass. He was there when they couldn't be," he said.